These letter openers open envelopes quickly and easily. Colors: white, red, blue, yellow, grey granite, strawberry granite, Neon yellow, pink or green. Individually bagged at no additional cost. 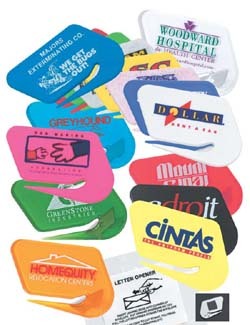 Includes a one color imprint , add .20 each for additional imprint colors.